In 1964 the Canadian scholar Marshall McLuhan published his seminal book Understanding Media: The Extensions of Man, that gave a new sap to the media studies introducing new concepts and perspectives. The book greatly influenced academics, writers, social theorists, educators and artists. Some of its ideas became very popular, and today they are considered relevant in the media studies and in understanding the contemporary mediascape. 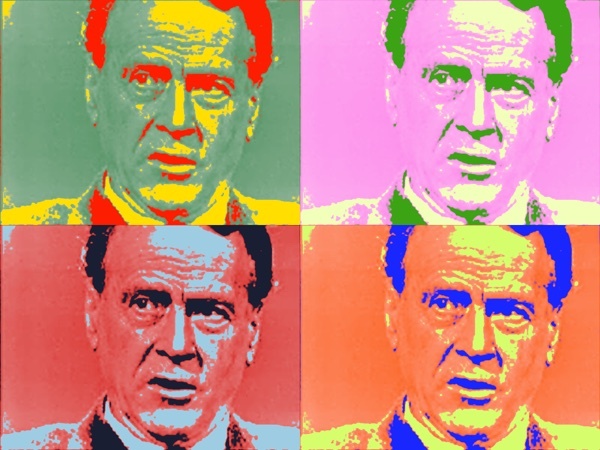 The centenary of McLuhan’s birth was celebrated in 2011, and in 2014 his seminal book Understanding Media is fifty. Regina Dürig and Gianna Angelini, respectively a PhD and a PostDoc candidates of the T-Node (Planetary Collegium, University of Plymouth), propose a reflection and a lexicon (Gianna is also NoemaLab’s Assistant Director). Some years ago I knew a young poet, his work was so ephemeral and condensed that it was nearly not there, which for me bore a remarkable beauty. At some point he stopped writing. Asked why, he told me that he had, for reasons that where not evident to him, developed serious aversions to more and more letters, so he couldn’t use them anymore. His poems were deprived of the already incredibly little material they required. Maybe this can be seen as just one case of creative neurosis in a line of many possible others. But to me it had a special, rather substantial quality since the material itself was dissolving. Usually, at least in my experience, writing crises concern questions or worries on a more narrative level – Is this piece at all literary? How can the narration go on from a given point? Etc. – they question the author, the work, the process. But not the very letters. And how could the young poet possibly have gone on writing once he had felt this irritation that eventually led him to the meaninglessness of the letters? The words had abandoned him and what was left were abstract signs in varied combinations that were of no use at all. Following McLuhan, the deepest effect of the phonetic alphabet, understood as a medium, is fragmentation. The experience of the abstract letters containing every possible word led to the idea that all matter consists of very small parts not containing any meaning in themselves – the atoms. The letters pulverized the world. And they also scattered community by shifting the oral tribe culture to a visual literate culture. They suddenly created single individuals who got an “eye for an ear”. Where before the “hyper-esthetic and delicate and all-inclusive” auditory sense could be found there was and is now the “cool and neutral eye”, which requires participation from the individual in order to interpret the perception. Considering these effects of the phonetic alphabet, the pulverization of the word is already inscribed in writing itself. But it seems to be like a blind spot – since the fundamental impression or perception of the world is that of fragmentation it is hard or impossible to notice that the alphabet, our literary material, is fragmented, too. But never the less there are artistic approaches taking account of this, exploring the alphabet as abstract material thus turning the crisis into a productive potentiality. The most striking example of recent date in this context is the work of the French group Oulipo (Ouvroir de littérature potentielle) which applied various constraints and mathematical concepts to literary writing. Most famous is George Perec’s lipogram novel La Disparition (1969) in which he doesn’t use the letter e or, even more fragmented, Raymond Queneau’s A Hundred Thousand Billion Poems (1961) in which the reader can combine the lines of ten sonnets in every mathematically possible way. In the preface Queneau states that he came to this idea during a creative blockade, talking to the mathematician François Le Lionnais, with whom he had founded Oulipo. An idea for a piece that is a crisis in itself – neither the author nor the reader can ever grasp it in whole, which seems unbelievable if you have the book in front of you: ten cardboard pages, every page is cut in fourteen strips, every strip contains one line which adds up to 1014 possible sonnets. Reading all them would take about 200.000.000 years. Abstractions bear cold distance, extension. Fragments get hot if jeopardized knowledge lures manmade numbness. Often print queries rotating sequences. Time unfolds vainly whereas x-axes yearn zonally. What happens if writing is constrained? How do limitation and restriction influence or transform the processes? I will try to give an answer from my personal perspective, retracing very schematically the steps in the creation of the Abécédéria text above: Before starting the actual text I decided to use some of McLuhan’s keywords and wrote down all letters in alphabetical order and filled in the words which seemed somehow crucial to me, many letters remained empty, the a included. So it took me a while to put “Abstractions” in the first position, after several trials with adverbs. After that the writing happened relatively fast, merely without the list. When I arrived at the x, y, z I had to consult the dictionary. After this, in editing, I made several small changes for rhythmical and tonal reasons, only one regarding the content (I replaced mythical by manmade). This process is, at least in my experience, fairly typical for working with constraints: a long starting phase for acquainting the limitation, then a rather fast writing phase and at the and an editing focused on rhythm and sound (often reading aloud). Turning back to McLuhan’s analysis of the phonetic alphabet and its cultural implications we might say that constrained writing, through taking already into account the fragmentation of the written word and the literate societies, is a way to overcome these effects to a certain extent in itself. Why? The constraints create texts in which both the writer and the reader are part of the process that is implied by the abstract rules. The texts show what they do, they perform themselves. Going even one step further we could say – theoretically – the texts don’t need a reader, since they are complete in the very moment in which the rule is fulfilled. This gives the reader back the ear he once had to trade for an eye – the distances between the reader and the written words diminish. What seems to be crucial is that there is an intention behind these texts. It is not arbitrary literature (as the Oulipians also emphasized), but an attempt to overcome fragmentation and abstractness by using them as artistic means and thus making them visible in the counter environment of other literature. This thought of liberation through intentional restriction can be summarized with Raymond Queneau’s definition of an oulipian author: he is “un rat qui construit lui-même le labyrinthe dont il se propose de sortir” (oulipo.net/fr/oulipiens/o) – a rat that builds itself the labyrinth from which it decides to escape (my translation). Queneau stresses in his analogy the construction of the maze, but he already installs the getting away, as a mere thought though, but still as purpose of the construction. When shifting the emphasis from erecting to escaping we see that the rats only can escape once they have built their prison – otherwise they might also be escaping but without knowing it, without any awareness of what they leave behind. So, translated to the effects of the phonetic alphabet, Queneau says that only the extreme cumulation of the fragmentation is a way to elude and overcome its implications. Is it possible to push this idea even further in literary writing? Another artistic approach that explores the alphabet’s abstract material under formal constraints can be found the monumental poem Alfabet (1981) by the Danish writer Inger Christensen, which for many writers is nothing less than a revelation. Christensen also used mathematical principles in order to construct the poem, thus, for example, the Fibonacci sequence, which determined the number of lines of each verse. There are fourteen verses, one for each letter from A to N, in alphabetical order. The poem’s first verse is this: “abrikostræerne findes, abrikostræerne findes” – apricot trees exist, apricot trees exist. Already here the central constraint reveals itself, it is the word “exists” – the author doesn’t use another verb. Christensen composes a poetic inventory of the material and immaterial world, focusing on nature, but not leaving out manmade inventions like the H-bomb. The enumeration of objects, plants, animals or concepts makes the possible narration become a meditative (re-)calling of things. There is, considering the verbs, no story line, no progress. Everything exists, in the same place and the same time. The choice of the items mentioned and left out is the only narrational aspect, their position in the text is the only hierarchy or chronology. What is created is a gaze – an individual’s open and non-judgmental consciousness wandering through the world, perceiving particular entities. The reader doesn’t have to follow or interpret a story, he just sees in his mind the different impressions. The reading experience is therefore immediate – it diminishes the distance between reader and the world by taking him right inside. Through neglecting narration and narrowing the artistic options down to rigid composition principles derived from the phonetic alphabet and the mathematical approach to nature’s proportion ratio, “Alfabet” dissolves the predominant conception of the self and the other. Christensen uses constraints that even exceed those of the Oulipiens to build a text in which she and the reader as an individual can disappear in order to create an intuitive and intense and whole impression of the world. Again, the re-connection of the literal fragmentation is empowered by an extreme encounter of the alphabet’s limitations. To conclude, we could ask if constrained writing is in our time the only way in which the alphabet as medium can be challenged at all? It is a mechanism that draws the author’s attention and intention away from narration, from messages, maybe even from the necessity of a reader. It encourages the work with mere material that doesn’t need to be transferred into something else: the result is above all still the material itself. McLuhan method of creative knowledge was strictly connected with the analogic way of thinking through metaphors. Following this transdisciplinary perspective, I will try to build a chain of concepts, all chosen in the semantic field of the ‘medium’, whose interconnection should make clear how the thought of McLuhan might influence the view of contemporary philosophy of languages. At the beginning of Understanding Media (1964), McLuhan tells us that a medium is “any extension of ourselves”. He suggests that a hammer extends our arm and that the wheel extends our legs and feet. Each enables us to do more than our bodies could do on their own. Similarly, the medium of language extends our thoughts from within our mind out to others. Indeed, since our thoughts are the result of our individual sensory experience, speech is an “outering” of our senses – we could consider it as a form of reversing senses – whereas usually our senses bring the world into our minds, speech takes our sensorially-shaped minds out to the world. McLuhan always thought of a medium in the sense of a growing medium, like the fertile potting soil into which a seed is planted, or the agar in a Petri dish. In other words, a medium – this extension of our body or senses or mind – is anything from which a change emerges. And since some sort of change emerges from everything we conceive or create, all of our inventions, innovations, ideas and ideals are McLuhan media. “The medium is the message” made its firts unassuming appearence in McLuhan’s 1960 typescript “Report on Project in Undestanding New Media” that he wrote for the “National Association of Education Broadcasters pursuant to a contract with the Office of Education, United States Department of Health, Education and Welfare”. By 1964, the phrase had become the all-important title of the first chapter of Understanding Media. Two years later, “the medium is the mess-age” appeared in Counterblast (McLuhan & Parker, 1969), and the “mess-age” became the “mass-age” in Take Today: The Executive as Dropout (McLuhan & Nevitt, 1972). “The ‘content’ of a medium is like the juicy piece of meat carried by the burglar to distract the watchdog of the mind” (McLuhan, 1964). We think and converse abput what we read on the newspaper, magazine, or book, what we heard on the radio, what we saw on television, much more often than we do about the fact that we were reading a newspaper rather than listening to the radio or watching television, etc. “The effect of a medium is made strong and intense just because it is given another medium as ‘content’ (McLuhan, 1964). The content of any medium – that ‘juicy piece of meat’ that takes prominence on our perception and distracts us from the deeper impact of the medium at hand – is none other than a prior medium tamed from its former wild, invisible state, and brought to lie now on our carpet in full view. Not only is the content not unimportant, it may be the best way of examining a medium and its impact. In a 1978 essay in New York Magazine, McLuhan further observed that “when you are ‘on the telephone’ or ‘on the air’ the sender is sent. The disembodied user extends to all those who are recipients of elecric information”. That means that the person who speaks on the phone or on radio or television creates and bocomes disembodied content for the medium – a voice without a face or a body, or, in the case of television, a voice with face and body but no substance. In the case of online writing, coming to the present, the process becomes even more streamlined, as users become content in the lines of text they create. This equation of user and content goes back as far as the literary criticism of I.A.Richards, who argued that the meaning of a text resided not in its author’s intentions but its reader’s legitimate interpretations. The complexity of the language as medium, is philosophically well known. In this sense, Derrida argued that language is an endlessly complex and unwieldy medium, and that writers are never entirely in control of their words, for this reason. When Plato is trying to explain, for example, why speech is a dramatically more effective way to communicate than writing, he ends up with this justification: Speech “is written in the soul of the listener”. With time, thanks largely to the influence of thinkers such as Agostino, was developed in the philosophy of language the idea that language is a semiotic structure: each term must have a corripondending meaning. This thesis produces the conviction that all the words of a language are functioning as denotational tools and that the language can be treated as an isolated medium (completely different direction from that suggested by McLuhan). Also, if the language is something that concerns the mind as Agostino argued, this concept opens a long season of mentalism in western philosophy. Mentalism and semantics deprive the word of his prosodic life, or as McLuhan would say, of his own life. With the growing importance of the philosophy of technology and the recovery approaches of visionary thinkers, indeed, this research, the research of a new philosophical point of view related to the language, is taking place today. It’s about finding an access to the significant that does not depend on a previous semantic reconnaissance of what that meant. If this can be achieved, finally we could have a convergence of theories about the study of language, in all its senses. Will the future of the philosophy of language be a Theory of the significant without significance? Will this be the theoretical heritage of McLuhan?